When the Southern Hemisphere settles into winter, Scott Wegener is thankful, as he has a rather disagreeable relationship with summer. Signs of the Times, July 2010. Feeling cold? If so, count yourself blessed because right now, somewhere in the world, it’s too hot! 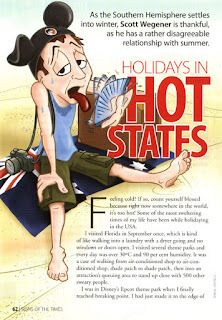 Some of the most sweltering times of my life have been while holidaying in the USA. I visited Florida in September once, which is kind of like walking into a laundry with a dryer going and no windows or doors open. I visited several theme parks and every day was over 30oC and 90+ per cent humidity. It was a case of walking from air conditioned shop to shop, shade patch to shade patch, then into an attraction’s queuing area to stand up close with 500 other sweaty people.